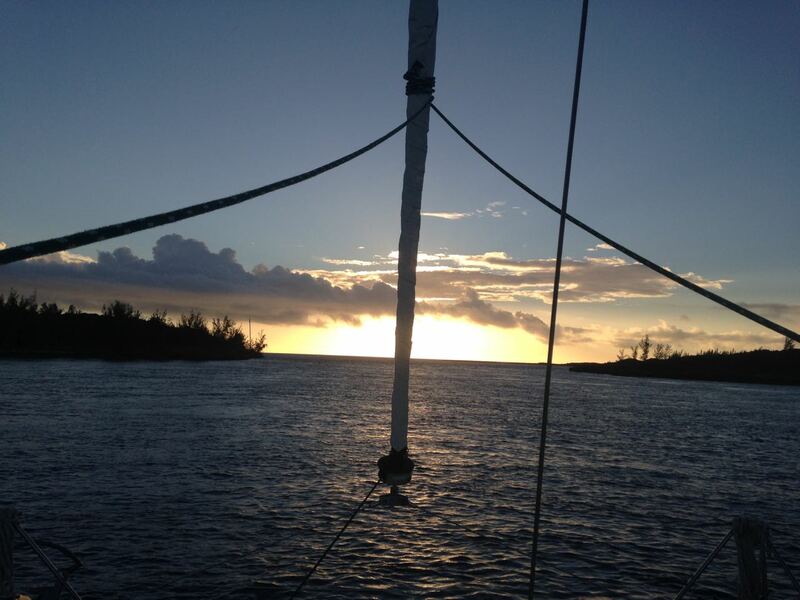 Planes, boats and bicycles--sv & rv Odin: Eleuthera--Another crossing! Another crossing: I'm awoken by a 2:00 am rain shower and never really fell back to sleep. I'm up by 3:30 (the alarm was set for 4--just about the time The Captain started snoring). 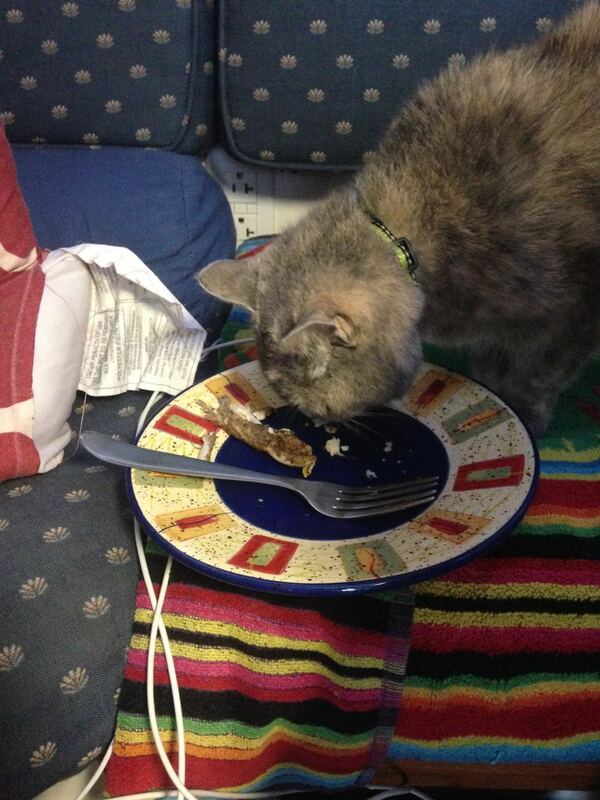 Amelia the Cat was game and had breakfast then joined me in the cockpit while I began preparations. Weather was confirmed. Checklist was started. Captain was awoken at 4:20 am and handed a Red Bull. Anchor was up at 5:00 am with the First Mate at the helm through the cut (seriously, he's not a morning person!). We had got a look at the inlet on our way in, and had our iPad Garmin BlueChart side-by-side with the chartplotter to confirm the course line. By 5:30 am, we were through the inlet and headed southbound. We would follow the coast of Abaco almost half of the 55 miles to the coast of Eleuthera. We were 11 miles out and I still had cell coverage! The sun slowly rises from 6:00-7:00 am. 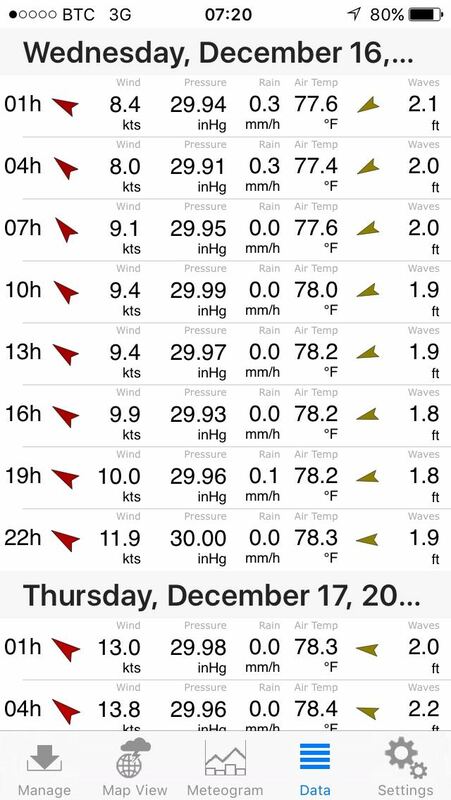 It was a relatively smooth ride with 1-2 ft seas with 8 kts of wind close hauled at 5.5 kts, motor sailing on one engine. We can see the sails of Silver Heels (AIS). No sign of our friends on sv Kelly Nicole. Amelia the Cat took a nap. As the Captain got up from a mid-morning nap, Angie W reminds me on FB to put out the trolling line (pink squid with squirt of WD-40). At 9:30 am, I was looking back when the Mahi jumps at the lure from the side. FISH ON! "He's not on. He's small. GRAB THE RUM. GRAB THE CAMERA!" 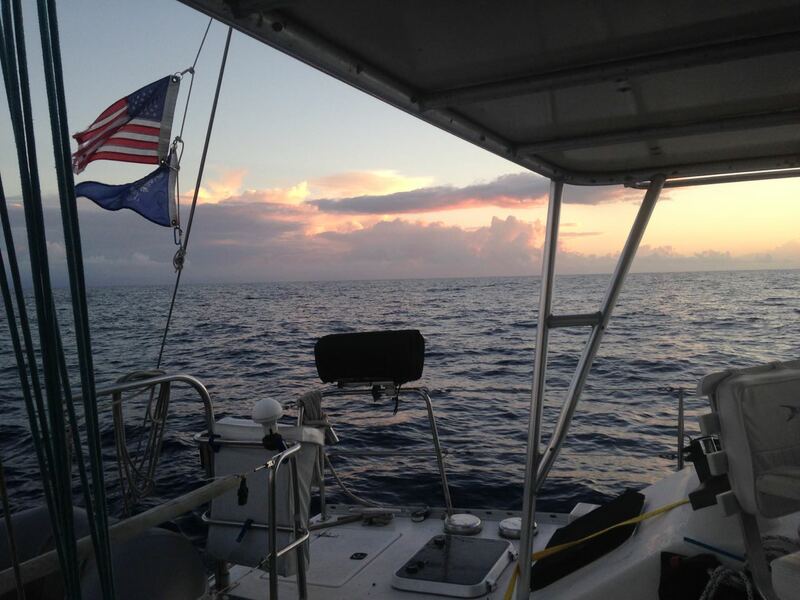 The throttles went to idle but the sails are still up as The Captain reels in our first fish. He vibrant and shimmering greens, blues and yellows were visible as he neared the boat. (Yes, I'm an animal lover, but I want this fish in my tummy!) He went crazy every time the Captain tried to raise him out of the water and up the steps. (I should have taken video but I was sure we wouldn't land the first one.) He finally landed him and my camera shy hubby immediately poses for his picture. Now what? "Throw him in the dinghy." He can't stand it. He's giddy, so he decided to clean it while underway (we later decided this should be done after anchoring, up on the trampoline with the fresh water wash down hose). "Please don't cut off a finger out here. I will kill you." If you think it's hard to reel in a 5 lb fish by hand, try taking his pic or cleaning it on a boat pitching in 1-2 ft ocean swells. So freakin proud of my husband. He really can do anything. The fillets aren't pretty but in 20 years, I've never seen him clean a fish, so he was probably out of practice. This is huge. Free fish could mean a drastically reduced grocery bill or more money for rum! 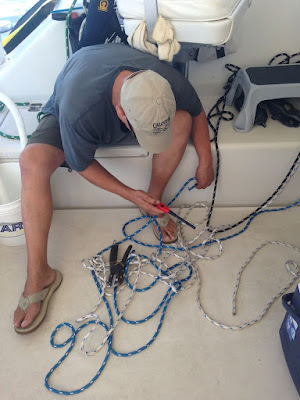 Now we need a fillet knife and a net--seriously, if he was any bigger we would have had trouble getting him on the boat! (zoom in) At the stern step--"Here fishy, fishy!" My hubby's first Mahi. Look at that smile! Yeah, he knows how to do everything. 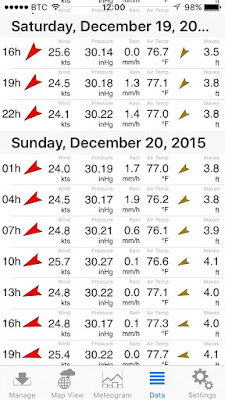 In the afternoon, the wind picked up to 12 kts with 1 ft swells but, they are closer together so a little choppy. We see two sets of sails behind us now, and finally Kelly Nicole pops us as an AIS target passing Silver Heels. We cleared the cut by 2:30 pm, so we decided to head across and anchor short of the Current Cut as Kelly Nicole turns for Royal Island anchorage. By 4:00 pm, we were starting to get tired and as we prepared to anchor--The Captain asked why I've slowed down with a mile to the beach. I respond, "I don't want to drive up on the beach!" 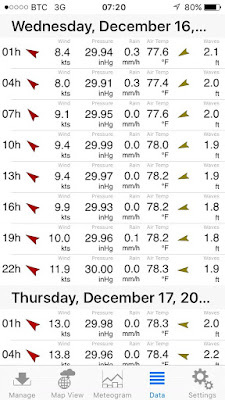 "Yeah, at 5 kts people will be scattering!" Woof. Silly conversation. Tired. We end up close-in to a pretty beach at Current Settlement with a few homes in view (this town was battered by 200+ mph winds from Hurricane Andrew). As the sun sets, we can see the Christmas lights on one of the patios. The grill was immediately cranked up to cook our Mahi. 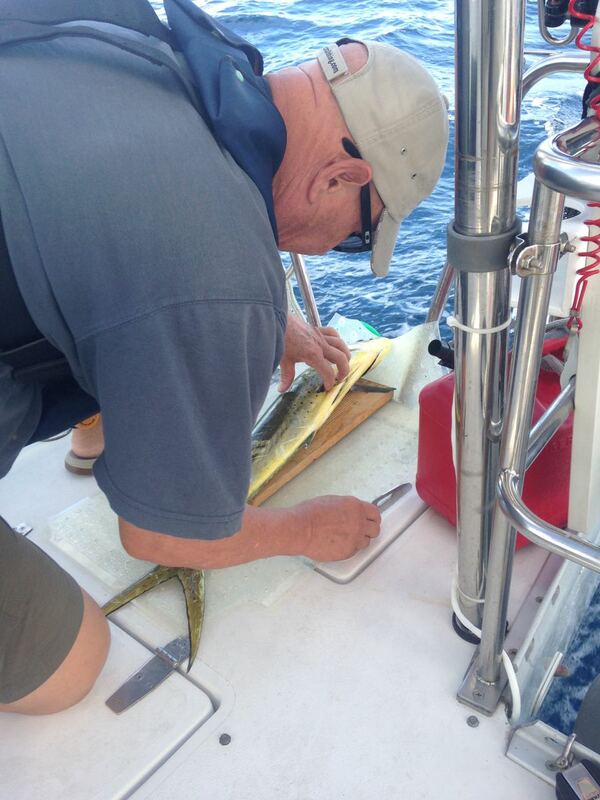 "What do you service with fresh caught Mahi? Nothing!" OK, rum & mango chutney were later recommended by friends. Next time I'll be more prepared! 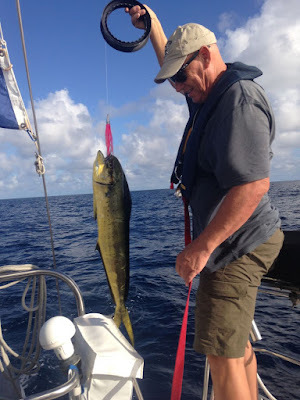 "I prefer my Mahi without lime juice, but I'll let it slide this time..."
Stats: total time 11:01, avg speed 5.7 kts, total mileage 63.2, motorsailed with full main, full genoa, 1/2 one-engine, 1/2 2-engines. 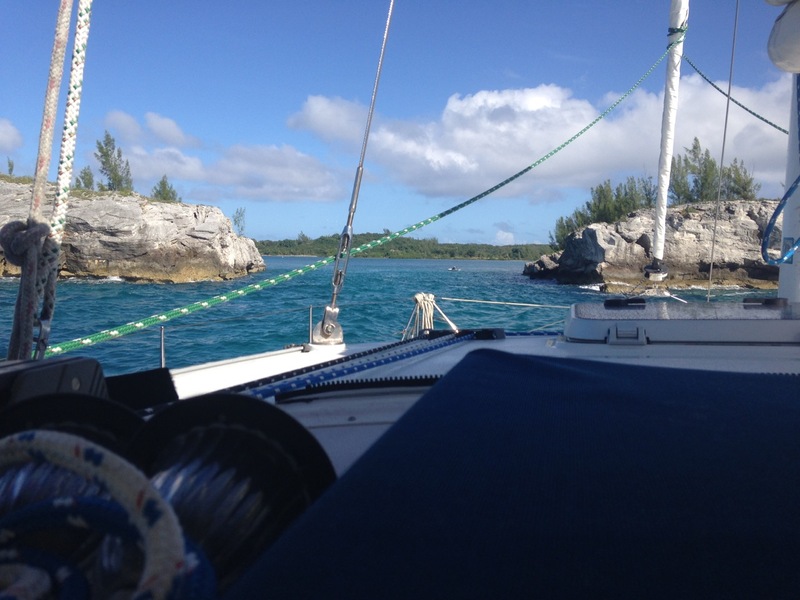 The tricky part about Eleuthera is there are very few sheltered anchorages with good holding (or marinas for that matter). We would have loved to make sheltered Rock Sound on the south end, but we didn't have the weather window or energy. In fact, at one point, The Captain considered "skipping" this island altogether, just stopping overnight and continuing through to the Exumas! However, Mother Nature and Chris Parker had spoken. Time to hunker down while another cold front passes through. We're up early to clear the tricky, Current Cut at slack water. 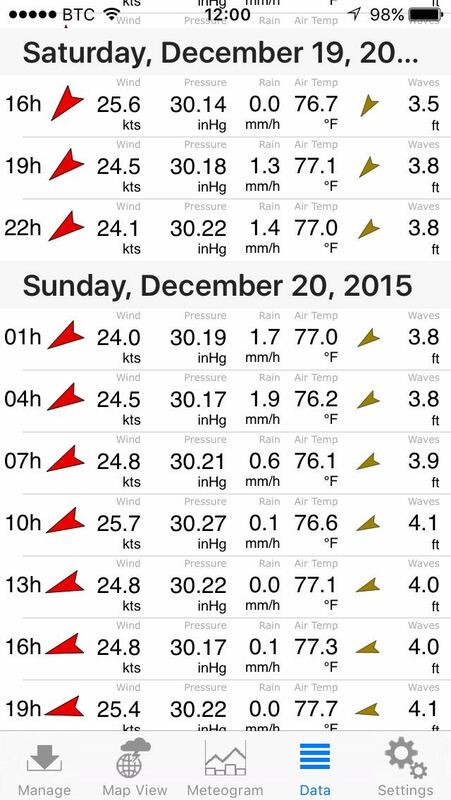 Some reports say the current can be 4 kts in the middle! 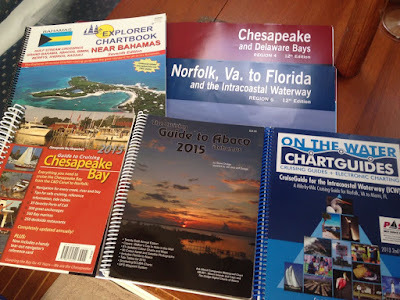 We were going to sail across to Hatchet Bay but it was pretty rough, with short set waves like the Chesapeake, so we tack over near shore and motor down the coast--call it sightseeing! (It turns out the guidebook also recommended this alternative route). The beautiful limestone cliffs are covered with lush vegetation (pictures don't do it justice). Homes are built out on the edge overlooking the water, with steps carved down to the waters edge. 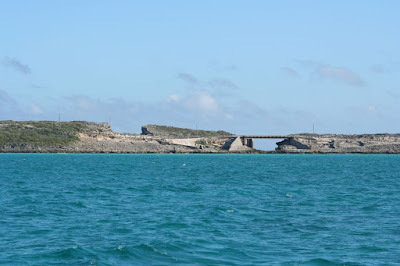 According to Explorer guidebook, "The most distinctive geological feature in N Eleuthera is the Glass Window, now a bridged breach at the island's narrowest part. 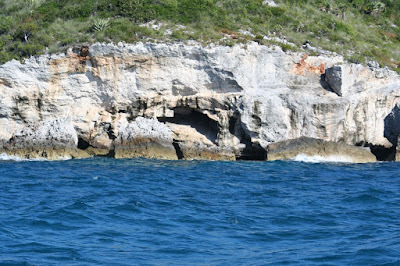 On its ocean side, where the reef is not continuous, waves gnawed at this weak point and broke the island's natural bridge in two. The manmade bridge over this scenic crevasse was knocked 7 feet to the west by the rogue wave in 1991 and impassable for some time." Yeah, let's rent a car and drive across that! There is also a scenic resort at Gregory Town, the home of the Pineapple Festival (although the predominant crop now is tomatoes and cabbages). He get's bored quickly. 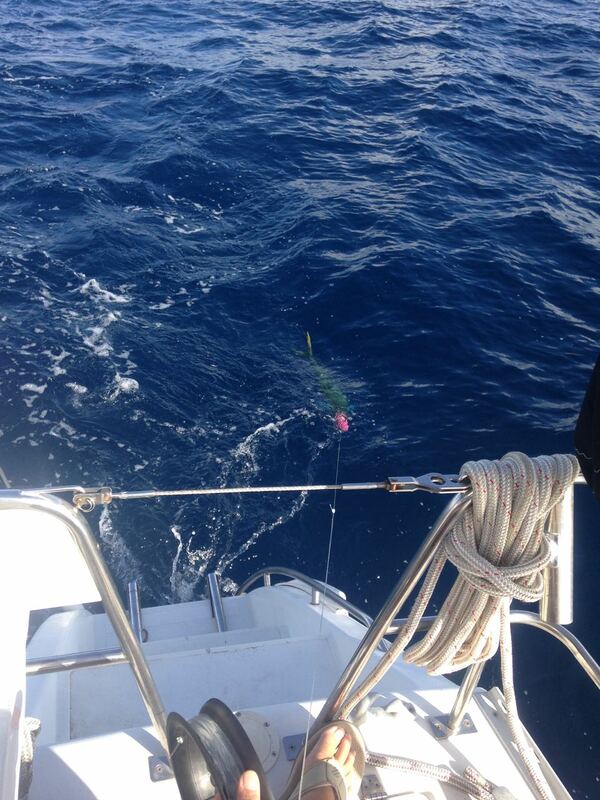 Shortening the reef lines while underway. There is the occasional "rock below the surface. No depth noted" to keep you on alert. I actually saw a quite large one. Nothing prepared us for the narrow limestone entrance to Hatchet after 4 hours of slogging into the waves. I think sv Summertime Rolls tried to warn me. The guidebook didn't give any warning, so maybe sometimes it's better not to know what is awaiting you. And then we saw the dinghy, in the middle, just inside the entrance. The Captain usually gives me "the look" for the occasional cursing, but he was cursing like a sailor when he saw that dinghy. He cut the engines and then said screw it. I hollered as we entered the limestone and the fisherman turned around. Did he move? No just reeled in his line. We were rewarded with a beautiful, protected little bay to sit out the weather. Always worried that each anchorage could be full, we only saw one other boat anchored and 3 on the moorings near the government dock. Per the guidebooks, we tucked into the shallower north corner where it was sandy (love.our.catamaran). Our hefty Mantus anchor skipped a few times before biting--perhaps a rock under the sand? The Captain dove on it to confirm the sand bottom and that it was buried. When I went to stow the "Near Bahamas" chart book, I realized how our nav station has filled with charts from places we've already been! We scouted out the two dinghy docks and went for a walk in town (both bars with wifi have been identified!). We stopped at The Front Porch, which has a beautiful view of the bay and had 2 rum punches made with fresh passionfruit (and scored 2 as a gift from the proprietor, fresh off his tree). After chatting politics and what time the "big" boat comes through the entrance (5:00 on Fridays, "we can do that with our eyes closed! "), we made our way back home. Watched Indiana Jones. Stats: total time 3:54, avg speed 5.4 kts, total mileage 21.1, motor sailed 1/4 main & genoa (7 kts), motored with main 3/4. TOTAL MILEAGE TO DATE: 1650.9! "Mommy, did you know we have a window?!" Everyone has asks how Amelia is doing. She's doing great. She has much more energy and spends a lot more of her day up and around. She has gone from eating a 1/2 can of food a day to a full can & is still begging despite the dry food also available. Luckily, the info about not being able to find cat food in the Bahamas is not true (we still have quite a stash, but she likes variety). 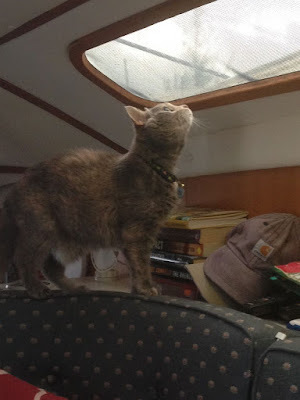 She scored some of her favorite Whiska pouches in Marsh (10 for $10) and a big can of Friskies in Hatchet Bay ($1.39). We love reading your thoughts about the places you are visiting for the first time. It takes us back. May you continue with safe and wonderful times. 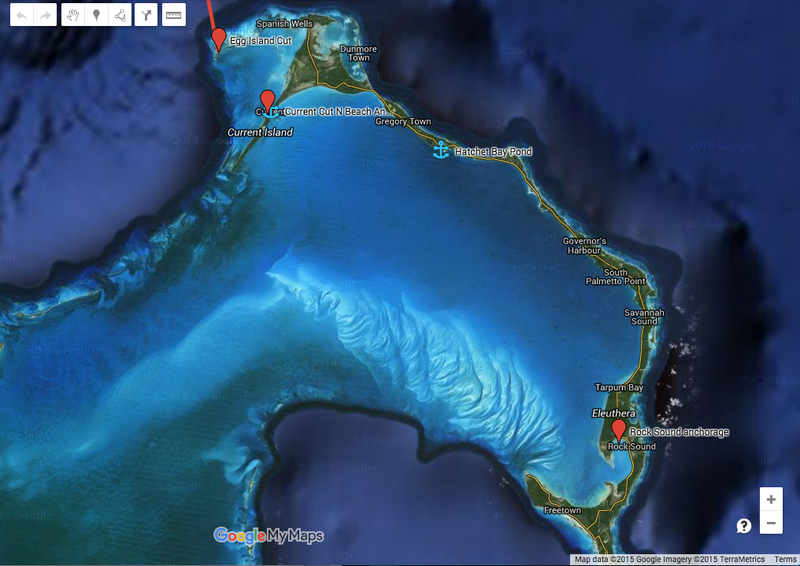 Hatchet Bay to EXUMAS, BABY!